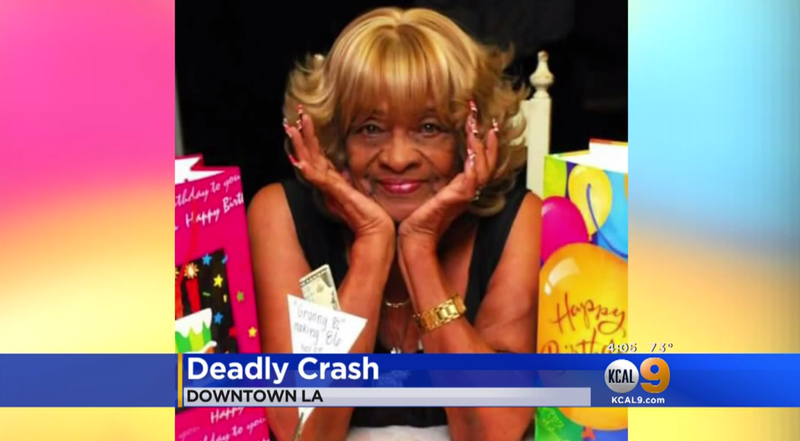 LOS ANGELES -- An 89-year-old woman was killed Thursday when a car flew off a freeway overpass and onto the northbound lanes of the Harbor (110) Freeway in the Westlake district, CBS Los Angeles reports. The crash occurred just before 4 a.m. just north of Third Street, according to California Highway Patrol Officer Dion Conley. The vehicle went off the Third Street overpass and fell onto the northbound lanes, he said. The Los Angeles Fire Department retrieved the body of the driver, said LAFD spokeswoman Margaret Stewart. The car apparently ran through the overpass guardrail and hit several cars when it landed on the northbound 110, causing multiple crashes. She has been identified as Barbara Hazely. Hazley’s family told CBS Los Angeles as saying Hazely stubbornly refused to give up driving even after her doctor recommended she stop. Hazely was on her way to a dialysis appointment, and about a mile away, when she crashed. All northbound lanes were closed at Third Street for the investigation and a Sigalert was issued. The lanes were finally cleared and the freeway reopened just after 8 a.m., according to the CHP.